A chip shop worker from England has been selected from millions of bored but adventurous people to become an intergalactic hero. 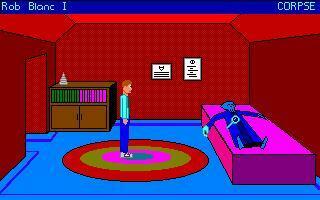 The first proper game to be made with AGS 2. "Early Yahtzee that's showing it's age. Fun, but very rough around the edges. Game uses dos-based engine. Compatibility issues may arise on newer systems. Recommend use of VDMSound, available from http://sourceforge.net/projects/vdmsound/, or similar." Too short, but pleasant to play through. For something this old, and drawn in Paint, it definitely deserves some praise. The writing is also above average. Not too keen on the choice of music, though. I found this short game to be entertaining. The puzzles were pretty good though I was stumped for a bit when I failed to check something twice. I feel the best part of this game is the humor. Definitely worth playing. Great game! Very concise. I love the intro and the rather short game play. Music is awesome. A very good stepping stone to the later Rob Blanc games. Brilliant! Rob Blanc is really someone you can relate to (If you're an English chip shop worker who becomes the defender of the universe with a sidekick called Paul). A nice little game with good jokes, but too short unfortuantely. And of course... the one that has kicked off the Rob Blanc Saga!!!!!11111!! !